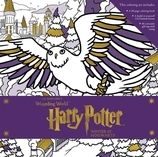 An interactive coloring set featuring everything needed for Harry Potter fans to explore the color of the winter season and share it with friends and family. From the snowy Great Hall to the Yule Ball, the winter season at Hogwarts is truly magical. This fun, interactive set features everything Harry Potter fans need to explore the color of the season. - A 48-page booklet featuring line art of special moments from the Harry Potter films, including Harry unwrapping his Firebolt (a gift from Sirius Black), Harry and Ron opening their sweaters from Mrs. Weasley, and snowy Hogsmeade. - A special, do-it-yourself, 3D wood Firebolt ornament from IncrediBuilds. Instructions for assembly and ideas for how to paint your ornament included. - 48 colorable gift tags, perfect for sharing the magic of the Harry Potter films with friends and family. 48 / 6 1/4" x 6 1/4"